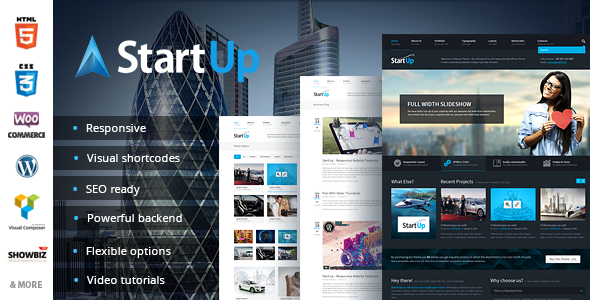 We are glad to introduce you brand new Start Up theme. Our team of developers and designers put all their expertise to implement and perfectly set up all the latest technology and design solutions on premium templates market to our Start UP theme. As a result – modern and versatile product suitable for a wide range of clients. We paid a lot of attention to versatility and universalism of this theme. IT professionals and those who is working with templates for the first time will easily customize their Start UP exactly the way they want it. We have created a unique and incredibly easy-to-use system of theme customization. You will also enjoy new menu capable to preview blog items and a lot of other beautiful design and technology solutions, we are pretty sure – you’ll like them. Visual layout builder. We added additional tools which may help to create pages different way that code-pasting. With Visual Composer you can add shortcodes and change block position without keyboard. Also we thinking about Visual Composer developers and prepared additional widgets without Visual Composer plugin modifications. News – for news page, widet or shortcode. Testimonials – will push testimonials to shortcode. Portfolio – for works page. Gallery – will help building image galleries. Vacancies – for building job application pages. Visual Composer + custom shortcodes and widgets. customize everything with simple and intuitive interface in your admin panel..
About 200+ shortcodes with comfortable shortcode generator. Recent portfolio and posts widgets with thumbnails. Portfolio post types – single image, video, description, project information. Documentation with code examples and growing community. Translation ready .mo & .po files included. And even even even more …. Hostin account should provide 128mb or ability to increase memory limit. Please contact our consultants at helpdesk or demo website. Additional recommendations about server configuration you may also meet in online documentation.